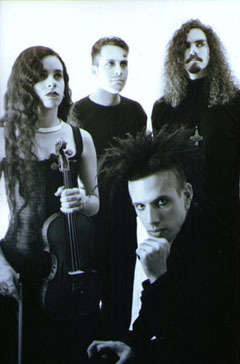 The Cruxshadows, an electro-goth band from the United States, started in 1992. They have just released a new Mcd called Tears, which includes two remixes from the entitled track, one from Fictional and the other by Apoptygma Berzerk. Also a new full length has been released, Wishfire. They are now in a tour in Europe to promote Wishfire. They will be in Spain, but unfortunatly not in Portugal, maybe for another time, who knows... The only member who's in the project from the beginning is Rogue and we send him some questions before he came to Europe with the rest of the band. Here is the interview with this great band from the States. nsi: Please, tell us a brief history from the Cruxshadows. Rogue: We've been around a while. 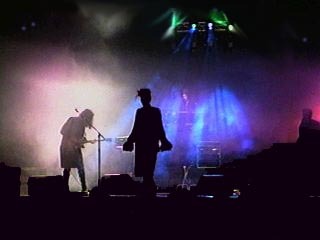 Everything started in 1992 and has evolved over the years, The popularity of the band has continued to increase, and each year we've been able to increase our fan-base geographically. We had a large number of difficulties over the years, and there have been so many labels involved, and so many band members in that period - that it might seem a little like a soap opera. A few times along the way, I just thought - "great...what do we do now", but we have kept plugging away and things tend to work out with a little tenacity. nsi: The present formation is not the original one, who are the elements of the band today? Rogue: The current line up has two members that have been with me for 5 or more years; Chris Brantley and Rachel McDonnell. Both play keyboards for CXS, but Rachel also plays the violin tracks. I used to do the violin playing, but slowly most of those duties have been ceded over to her. The latest addition is Stacey Campbell who has been playing guitar with us over a year... she came on in January of 2001. I feel very good about the current lineup, and I must say, that more than ever before it feels like a family. I think our chemistry is really strong, especially live. We are not only individuals on stage, but a complete unit....each relying on the others. nsi: What bands have influenced you or still influence your creative work? nsi: What are the main ideas behind the Cruxshadows? nsi: Your sound moves in between gothic and electronic. I know that the electronic scene is growing very much in the USA. And how is the gothic scene today? Rogue: In my opinion they are in many ways one in the same. 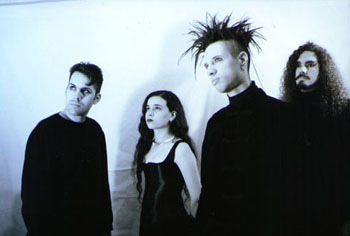 There are very few "traditional" goth bands in this day and age...but I think the definition of goth has expanded from its deathrock roots to encompass all of the dark emotional music from the layered guitars of the Coucteau Twins to the bleeping, thumping sounds of Neurotic Fish. If you ask anyone what goth music means, you get a different answer. Its because the music is as varied as the people who like it, and goth is about individuals who are similar in sentiment...they will never AGREE on what constitutes gothic. nsi: I heard that a USA congressman is fighting against gothic subculture because "goth teenagers are drawn into potencially dangerous behaviour", he said. What's your opinion about his affirmation? Do you think there is any relation between gothic subculture and deliquency? nsi: And what do you think about this kind of people, like some politicians or religious fanatics, who try to oppress alternative forms of art, not only music? Rogue: I think they are un-American, I think they are dangerous, but I think they have a right to their opinion. It is a fundamental American idea that we are made up of many peoples, with many ideas, and there is a place for all of us. When we as a nation loose sight of the fact that our strength lies in our diversity, we will become not a leader among nations...but a joke instead. That is why, it is important to defend the rights of everyone to speak their opinion, even if that opinion states that there should be "no free thought." Because if you eliminate anyone's ideas, you are fast on the road to eliminating everyone's ideas. nsi: You’ve released some time ago a new Mcd, Tears. Can you tell us something more about this new release. Maybe about the participation of Apoptygma Berzerk and Fictional? Rogue: We were really happy to have them participate. We met Fictional through our manager at Eurorock, and they were very cool and very friendly. And we had been fans of their material...so we were very happy they were able to do a remix. I think it turned out pretty good. We met Stephan from Apop in Norway on our last tour. We hit it off real well, which is cool because the last two discs (Seven & Welcome to Earth) were among my all time favorites. He spent a lot of time getting the right feel for the song, and he got feedback from me at various stages along the way. He was very nice to work with, and I can't say enough good things about Apoptygma berzerk. Overall, I must say i am really pleased with the CD. Its gotten a great deal of radio play in Germany and has spent a good amount of time in the top 5 of the German Alternative Charts. nsi: You are also preparing the release of a new album. When do you think it will be released and what can we expect from it? Rogue: I think it is a bit more synthesized in its texture, but it still preserves the sound and the balance of our earlier releases. Its called Wishfire, and it should be available at the end of the summer. Most of our fans should like it, and hopefully we'll gain some new fans as well. Although, I'm a little biased, I think its our best work yet. 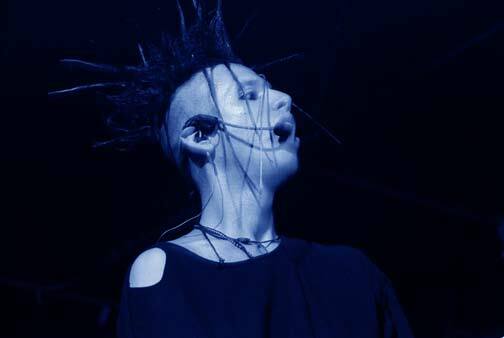 nsi: The Cruxshadows will play in Europe in May at Wave Gotik Trefen. Are you planning more shows in Eurpoe, maybe a promotional tour of your forthcoming album? And something planed for Portugal or maybe Spain? Rogue: We will be doing a full tour of Europe to promote Wishfire. I believe we are booked in Barcelona with Mesh, but I don't think there's a show in Portugal yet, although we would love to play one if you know anybody. nsi: After the release of the new Cd and the shows in Europe, what are your plans for the future? Rogue: We return to the US to begin touring there. we finish up at the end of the year and then do it all over again. nsi: Thank you and any final words or requests?